Battle of the Planets! G-Force! Five incredible young people with superpowers. And watching over them from Centre Neptune, 7-Zark-7 — Watching, warning against surprise attacks by alien galaxies from beyond space. G-Force! Fearless young orphans protecting Earth's entire galaxy. Always five, acting as one Dedicated. Inseparable. Invincible! Battle of the Planets originated in Japan as Science Ninja Team Gatchaman (1972-1974). In 1977, producer Sandy Frank licensed the series following the excitement generated by Star Wars. Indeed, one can see the influence of Star Wars not only in the design of the backwards slanting title, but also in the title itself — Battle of The Planets — the soaring orchestral music, and the addition of the robot 7 Zark 7, a close rip-off of R2D2 in both design and name. The series began syndication in 1978 and was usually broadcast weekday afternoons after school hours and before the 6 p.m. news. The complete series is available below from my personal archives. Frank whittled the original 105 Gatchaman episodes down to 85. The Japanese series was more violent than Battle of the Planets, showing characters die, and included the occasional swear word. People didn’t swear in Battle of the Planets, and they didn’t die either. 7 Zark 7 often noted in his expositions between scenes that characters who appeared to die on screen (when a ship exploded for example) parachuted to safety or otherwise somehow escaped unharmed. 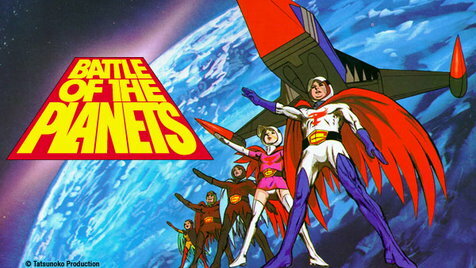 Gatchaman's action took place on Earth while Battle of the Planets went interplanetary and visited Earth-like planets. The Science Ninja Team Gatchaman was renamed G-Force. G-Force's ship, the God Phoenix in Japan, was changed to just the Phoenix for U.S. audiences. The masked archenemy Zoltar, a hermaphrodite named Berg Katse in Gatchaman, suddenly had a sister in Battle of the Planets. One of the best decisions Frank made was to hire Hoyt Curtin to compose the theme song. Curtin, who also composed the theme for Jonny Quest, produced the opening credits music for Battle of the Planets that nearly matches the Jonny Quest theme in tempo, pacing, and excitement, and is regarded as a classic in its own right. Similarly, Frank didn’t skimp on the voice cast. Instead of unknown actors, Frank chose some of the era’s better-known film, TV, and vocal talent, including Casey Kasem (Mark), Ronnie Schell (Jason), Janet Waldo (Princess), Alan Dinehart Jr. (Tiny), Alan Young (Keyop, 7 Zark 7), Keye Luke (Zoltar), and Alan Oppenheimer (Commander Gorok and others). Despite the watering down of the original episodes, Battle of the Planets quickly found a ready audience in U.S. youth eager for any kind of outer space fantasy with masked villains, giant spacecraft, robots, and heroes with superpowers — and G-Force delivered! For many late Baby Boomers and Gen Xers, Battle of the Planets was their introduction into Japanese anime and it is no coincidence that there was a corresponding rise in interest following the series broadcast. In the wake of the initial release of Star Wars in 1977, it seemed like every Hollywood producer and network executive made a bid for a piece of the action. Soon, along came a wave of TV shows that sought to capitalize on the phenomenon. Battlestar Galactica (1978) and Buck Rogers in the 25th Century (1979) are the two most think of in this regard, but there were a plethora of other shows including Quark (1977), Logan’s Run (1977), and several Saturday morning live-action efforts, such as the related series Space Academy (1977) and Jason of Star Command (1978), among others. While Gatchaman predates Star Wars, Battle of the Planets is a premier example of the influence of George Lucas' masterpiece on pop culture. The current copyright holder of Battle of the Planets prohibits uploading any individual episodes of the series, but a complete episode list is provided below. For a small flavor of the series, Battle of the Planets: The Movie, a compilation of three episodes of the series, is available on the Aeolus 13 Umbra YouTube channel. It is noteworthy for retaining some of the original more-violent Gatchaman content not in the Battle of the Planets series. Unfortunately, Alan Young was replaced as the voice of 7 Zark 7 and the opening theme was remixed with a stronger rhythmic base, making one appreciate the original performances all that much more. Very interesting and entertaining blog. Battle of the planets is son’s favorite series. At first, I was always forced to see the episodes but later on I started to like it.